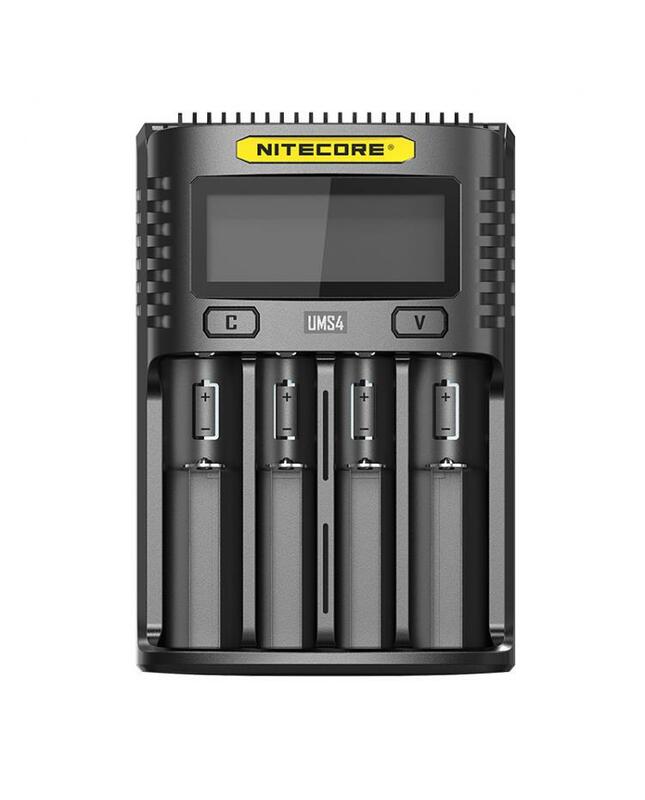 The Nitecore UMS4 Intelligent USB Battery Charger with 4 slots, made from durable and fire-retardant PC material, the nitecore charger with innovative QC mode, the total max output current reach to 4000mA, single slot max output can reach to 3000mA. it can charge 4 batteries simultaneously and controlling each slot independently. the UMS4 with optimized IMR battery charging program, which is able to monitor the entire charging process, ensuring that the cut-off voltage is always within safe limits to extend the lifespan of the batteries. the UMS4 with a large LCD display screen, it will show the charging information clearly. short press the " V " button to cycle through different charging information, UMS4 will automatically select between 3 charging modes(CC, CV and -DV/DT) according to the battery type and capacity. long press the " C " button to enter the charging setting mode manually. the charging voltage selection from 3.7V, 4.2V, 4.3V, and charging current from 300mA to 3000mA. the nitecore charger compatible with the various mobile power source, solar panel, and USB adaptors to ensure endless power supply.